A group of fourth year Physiotherapy students are over the moon following their experience at the Decentralised Clinical Training in Madadeni, near Newcastle. 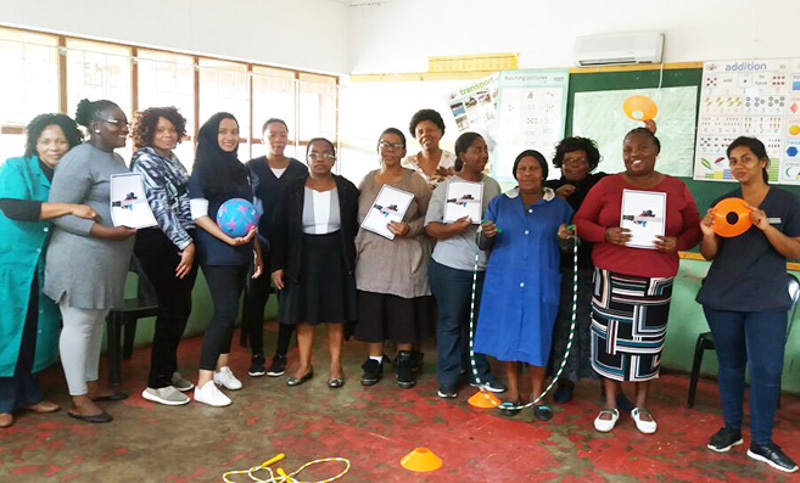 The students; Ms Shanice Basdeo, Ms Zainub Mudhoo and Ms Londiwe Ndlovu are currently completing a community block at Madadeni hospital, and belong to the first class of Physiotherapy students to be involved in the DCT programme. ‘During our community block, we did extensive research to identify health-related problems in the community. Now we are trying to use our knowledge and skills to address these issues,’ said an excited Basdeo. The students’ focus during their five-week block was on promoting Physiotherapy Back Week, identifying and promoting the physiotherapy profession in a rural and community setting as well as performing a community-based rehabilitation project focusing on helping and enabling people living with disabilities to optimise their quality of life. ‘To promote these issues, we held a workshop at Boma Sizwa special needs school, where we educated teachers, teacher aides and maintenance workers on the importance of back care, exercise, posture and correct lifting techniques using visual aids such as posters, pamphlets and demonstrations,’ explained Mudhoo. The group also had an opportunity to engage with a wider audience on Newcastle Community Radio, where they gave talks on back care, stroke, exercise and importance of physical activity. ‘We also focused on the hospital staff and healthcare workers, by creating an exercise boot camp where nurses, doctors, administration workers etc. were invited weekly to the Physiotherapy Department to partake in exercise classes to help improve overall health and fitness,’ said Ndlovu. ‘At first it seemed as if we were just thrown into the deep end on impulse and without enough preparation and confidence that we’d make it out there, but who knew it would maybe be the best experience we’d ever go through in our lives,’ continued Ndlovu.